SponsorshipWhy SponsorshipIncreasing your exposure to the Ontario camping industry is particularly important in tough economic climates. As your competitors cut into their marketing budgets they create the perfect void for you to fill so your name and product will be top of mind. We are the largest industry association representing campground owners and promoting camping in Ontario to hundreds of thousands of campers. Increase your marketing return-on-investment by working with Camping In Ontario to increase your exposure to this ever expanding market. Sponsorship is the best vehicle available for enhancing your company profile with your key customer. Whether you are trying to reach campground owners or campers, Camping In Ontario is the place to be. You may already be looking at getting involved in some of our programs.We can customize a package to fit your needs and budget which will increase your exposure and your sales and get the ultimate return on your investment! There are many activities and opportunities through the year to get your message out and sponsorship may include exposure at one or several of the following marketing venues. Website: www.campinginontario.ca attracts campers and campground members. Our site also features an Official Supplier section that visitors and our members can search for products and services. Our website receives over 2 million page views every year. Directory: Camping in Ontario remains THE definitive campground directory in Ontario. 170,000 copies are produced and distributed each year. The average shelf life of each issue of Camping in Ontario is three years. 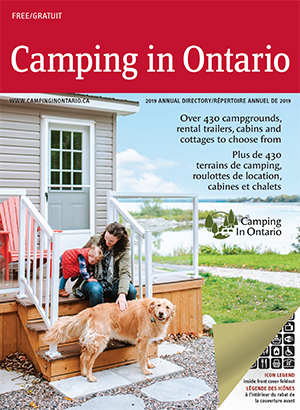 Copies of Camping in Ontario are distributed through many different and effective channels, including: twelve RV and Camping consumer shows in Ontario, the U.S., and Quebec, as well as through the Ontario Tourism Information Centres, local chambers of commerce, RV dealerships, campgrounds and more. Buyer’s Guide: The annual Buyer’s Guide is published in early spring. This is a great opportunity to put your company front and centre in front of our Campground members all year long. A recent survey conducted by Camping In Ontario / OPCA revealed that 81% of members refer to the Buyer’s Guide whenever they are looking to make a purchase for their campground. Regional Meetings Trade Shows: Each spring we host regional meetings across the province to bring the members together prior to the start of the camping season. Each meeting features a half day market place where campground owners make their spring purchases. The second half of the day features guest speakers. CampEx and Convention: Each fall our members get together for three days of learning and networking as they prepare for the new camping season ahead. The first day of convention features a trade show of suppliers that serve the camping industry and our members spend a great deal of time walking the trade show and getting to know our associate members and the services they provide. Don’t be surprised if you walk away with new clients or orders as our campground owners begin planning for the campground season ahead. Update, Member Newsletter: The Update is the official newsletter of Camping In Ontario. It is published four times a year and is delivered to all campground members of the association as well as other stakeholders, including government representatives, Official Suppliers and affiliated tourism organizations. To customize a package that works for you and meets your marketing needs, please contact the office at 877-672-2226.